Bentley Farm Gazette: Ayrshire Junior Grand Champion! Today was an exciting day for Bentley Farm at the Dutchess County Fair as Jacob's heifer, Vanilla, took her place as Ayrshire Junior Grand Champion. This feat was last accomplished by Bentley Farm thirty years ago when Uncle Sam's heifer won the same award. 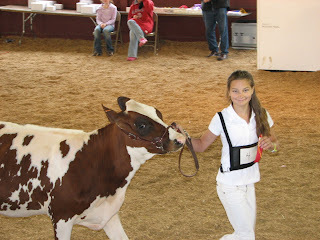 Vanilla's dam was purchased and bred by Isaac so she also received the Best Bred and Owned Ayrshire award. The competition was not stiff this year - only six heifers were in the entire junior Ayrshire division. However, we were confident that Vanilla could withstand more competition. Jacob competed against Rebecca and Luke - they did well, too - they received second and third! 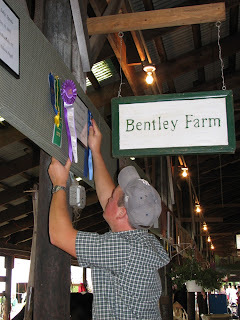 A companion in our barn joked with Nathaniel as he put up all of Vanilla's ribbons, "You know it's a good day when it takes longer to put up the ribbons than it does to show all of your heifers." It was a good day!